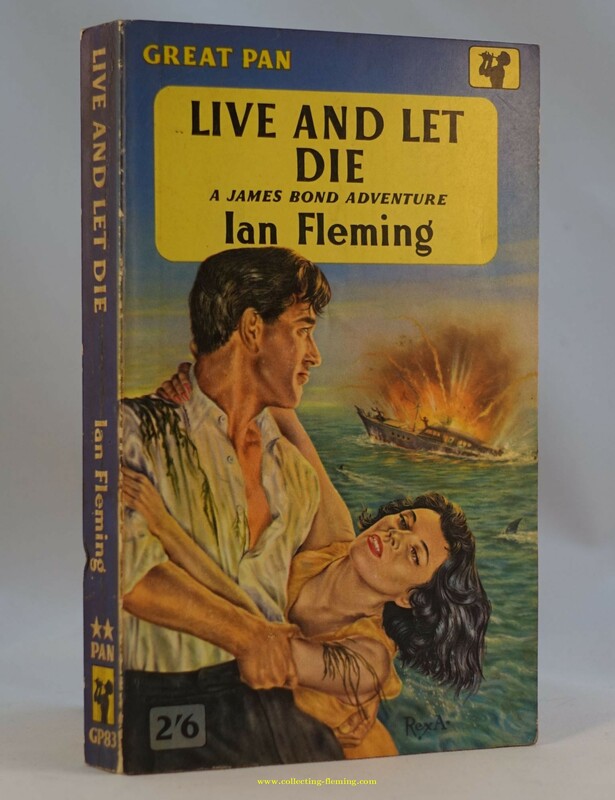 Although the 2nd title in the series of Bond books, Live and Let Die was published after Moonraker so is the 3rd title published by Pan in paperback. There are 2 variants of the 1st edition. The standard edition is about 15mm thick and like most of the Pan paperbacks the paper darkens with age. The “thick paper” edition is about 18mm thick and has better quality paper that tends to stay white. The thick paper version lacks the 1st blank page of the thin version so starts with “Praise for Live and Let Die”. This may have been done to try and keep the width down a bit, as the card covers are identical between the editions part of the front cover artwork can often be found on the spine. As with all Pan editions the card covers are oversized and the whole book trimmed to size explaining how its possible to have books of differing thickness in the same covers. The thick paper editions are rarer so more in demand (and hence more expensive). A similar issue exists with the 16th Pan edition of For Your Eyes Only. 50c sticker to front cover (Canadian pricing). If you have a copy of this you would be willing to trade or sell please get in touch.